Nail Salons Naples, FL: Learn About Dip Powder Manicures! 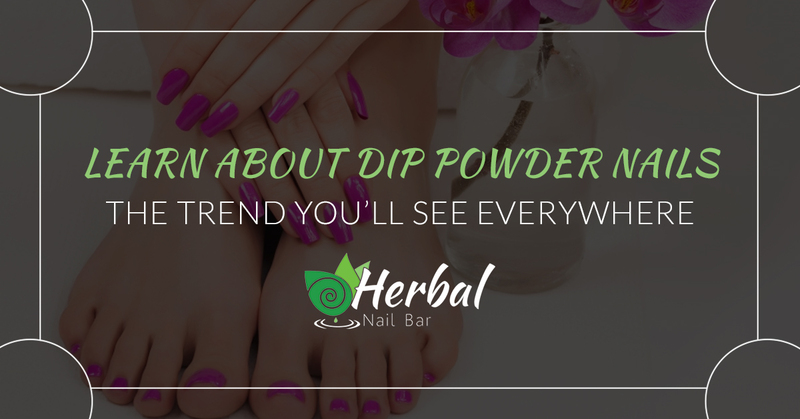 If you’ve spent any time following beauty vloggers or Instagrammers over the last year or so, you are likely familiar with dip powder manicures. While this process has been used for quite a while, it is only just becoming mainstream as more people decide they want to ditch acrylics or gel manicures and avoid UV drying lamps. Lucky for you, we offer this trendy manicure at our nail salon and have both the popular SNS powders and Powder Perfection powders! If you are unfamiliar with powder manicures or want to learn more, keep reading! The name “dip powder manicure” is pretty self-explanatory. First, a base coat is applied to the nail and the nail is dipped into a pigmented powder or the powder can be spooned over the nail. Then, another layer of base coat is applied to the nail and the process is repeated until you have a beautiful, even color. Finally, a sealant is placed on top, turning the final layer of powder into a gorgeously smooth and shiny top coat. How Long Do Dip Powder Nails Last? Dip powder nails can last for two to four weeks with proper care. For those who don’t want to use UV lights to get a strong manicure with gels or acrylics but are tired of regular polish chipping after a few days, dip powder manicures are the perfect option. How Do You Remove Dip Powder Nails? Because dip powder nails are so strong, the color needs to be removed the same way you would remove gels or acrylics — by soaking them in polish remover for about 15 minutes. Remember, as with any polish, never try to pick or scrape dip powder nails off as this can damage your nail. Where Can I Get Dip Powder Nails Near Me? At our nail salon in Naples, FL, you can treat yourself to a beautiful, long-lasting dip powder manicure! Each manicure service begins with an aloe vera and Dead Sea salt soak to gently exfoliate away dead skin. If you choose one of our organic manicure services, you can experience an aromatic herbal blend of your choice. Our herbal blends include a stress relief blend with lavender and chamomile, an invigorating rosemary and peppermint blend, and so many more! At Herbal Nail Bar, we always try to accommodate walk-ins, but the best way to ensure a great experience is by booking an appointment online, especially if you are choosing a specialty service like a dip powder manicure.